7/17/2014 - At face-value, Enforcer of the Forgotten exists either to make single-card lobotomies more effective or to combo with an effect that exiles cards from your opponent's library. It also happens to hose suspend, rebound, Misthollow Griffin, and similar mechanics that let you play cards directly from exile. My question is: Is that a fun aspect to figure out and take advantage of, or is it sideways enough that it should be made explicit on the card? What if I remind you that it also hoses Act on Impulse and every card with cascade? I would expect at least some folks to argue that's reason enough not to make the card at all. Maybe I'm one? I think it's a really cool ability and it's a nice "White has a rare 2/2 with a technical ability" type of thing that also plays well with all those banishing cards. I think I like this going on a big ol' multicolor monstrosity for the splash value, and in case it ends up whiffing you've still got a reasonable meatgate. Something just a little beefier than 2/2. Also, is there a way to get the autocard working on mobile? It doesn't even fall back to a regular link right now. Hmm. I would've expected it to click out. Dang. I love these kind of rules / restricting abilities on white bears. Hate Bears as they are called. I want to play an effect like this early, as I want it to be a rule over the game. If this was on a large and higher costed creature, it would not matter as much. Cool Idea Jay I really like this one. Feels very white. also that art is amazing. I really enjoyed how theros played around a bit more with the p/t of its hate bears. Avoiding the 2 mana 2/2 or 2/1 makes the decisions more meaningful and provides a bit more variety to the strategy involved. I also loved to see a creature like Eidolon of the Great Revels provide another color with a hate bear. While white is probably the color for this card, I'd love to see more variety on this. This needs to say face up cards in exile, since otherwise it isn't enforceable. It is. It would just ignores face-down exiled cards, obviously. I was just giving minute templating feedback. This card is pretty dangerous. Any effect that entirely prevents a player from casting their spells has the potential to make the game an extremely dismal experience for the opponent. Would need serious development to be sure. Silence is a thing, as is Godsend. The question is really whether there are enough o-ring/dissipate effects in the standard with it to make that card dangerous. That's certainly true. We could also avoid hosing things like Cascade by tweaking the effect to something like "Whenever an opponent casts a spell that shares a name with an exiled card he or she owns, counter that spell. Its controller draws a card." Rest in Peace? Tormod's Crypt? Although I'm not sure if "hose all cast-from-exile" effects should be a different card to "can't cast spells from your hand with the same name as an exiled card." It might be too open ended working with any card in exile? For instance, Uba Mask says "never draw cards again" and Knowledge Pool says "never cast spells again". And even if it only worked to stop you casting spells from your hand, it means R&D can't easily make a card that needs to exile a lot of cards from a library, even as part of a larger effect, not directly as mill? Bazaar of Wonders. That was one of the first decks I worked really hard to make work back in the old days. I would mill people and then it would make all their spells uncastable. 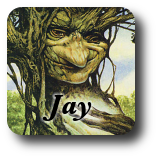 Interestingly, the deck was totally awful against newer players, since newer players didn't have any duplicate cards! It is on a 2/2 creature, so it is more easy to deal with it, so it is ok if it hoses act of impulse and cascade. Just kill the enforcer. 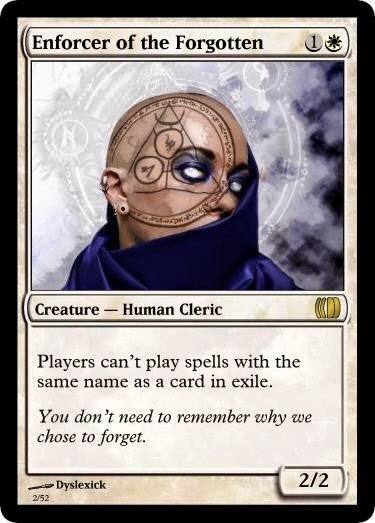 That being said, if you worry about hosing those things, you could change the wording to the more inellegant: players cannot cast spells from their hand if they share a name with an exiled card.